The redevelopment of Liddell Road is a cornerstone of Camden’s plans for West Hampstead. The site is presently occupied by a dwindling number of businesses. Dwindling because Camden, which owns the land, has already begun to terminate their leases and they are trying to find alternative premises. Liddell Road is slated to be the site for a new local authority primary school opening in September 2016. Technically, this is an expansion of Kingsgate School – although it’s very much a satellite expansion as the two sites are almost a mile apart. To pay for this school, cash-strapped Camden is planning to build residential flats for private sale on the site alongside an office block. The original plan has been revised and the bulk of the 105 flats will be in a 14-storey high building as well as lower-rise units. That’s higher than the tallest Ballymore block at West Hampstead Square. 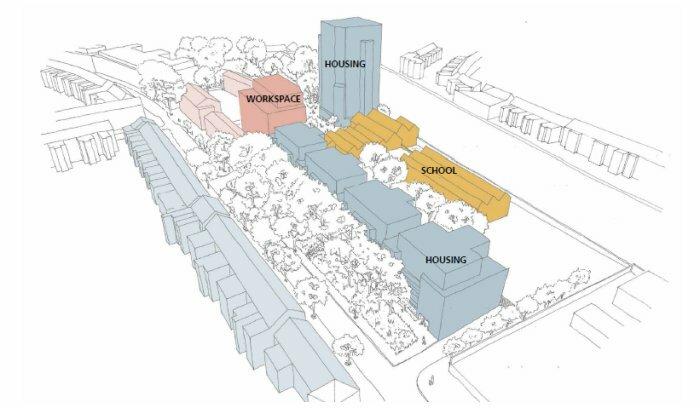 There is also criticism that Camden has been awarded £6m in central government funding for school building and plans to make a £3m profit from the development, but all that money is to be spent elsewhere rather than some (or all) of it being used to enable some affordable housing in the Liddell Road scheme. Camden’s quota for affordable housing in any private development is 50% of floorspace. This is rarely met in reality, but many will find it hard to swallow that a development led by the council itself has absolutely no affordable housing whatsoever. It should put more pressure on the development of 156 West End Lane to deliver at or even over quota if West Hampstead is to remain an even slightly mixed community and not become a neighbourhood dominated by two-bed flats of affluent young professionals. The original proposals was for commercial space for around 130 jobs, which has been raised to 160. This is now being mooted as flexible office space for fast growing small busineses. The West Hampstead International School – a campaign for an enormous primary/secondary free school – would like the Liddell Road site for its school, and a new free school called Kilburn Grange free school already has Department for Education approval. It plans to move into the former College of North West London on Priory Park Road in Kilburn once the Marylebone Boys free school, which opens there this September, moves to its permanent home in Paddington a year later. It will offer 420 places, which is precisely the number of primary places locally that are needed. Interestingly, both its consultation meetings are being held in Kingsgate Community Centre, the Camden side of Kilburn, and firmly within the catchment of any expanded Kingsgate School. Would this mean that the Kingsgate expansion school is still needed? Would it mean that the primary school component of the West Hampstead International School was still needed? To move from too few primary places to too many – and all at the cost of the tallest tower block in West Hampstead – would seem perverse. The big meeting though is on July 22nd from 7-9pm when there’s a “Devlopment Management Forum” at Sidings Community Centre. If you’re interested in this – for, against, or want to know more – this is the place to come. For more info on the proposal, Camden has a dedicated page.